The New York Times has an excellent piece http://www.nytimes.com/2012/08/27/world/americas/helmeted-volunteers-monitor-student-protests-in-chile.html?ref=americas on the volunteers who monitor Chile’s student protests, documenting arrests and cases of abuse by police. The Jerusalem Post published an interview http://www.jpost.com/JewishWorld/JewishNews/Article.aspx?id=282401with Shai Agosin, president of Chile’s Jewish community, who describes worsening relations between the country’s 18,000 Jews and the approximately 400,000 Chileans of Palestinian descent, the largest community in South America. Other concerns include an influx of Middle Easterners to Iquique, a port city in northern Chile, where Chilean authorities discovered an Iranian rocket, and incidents involving neo-Nazis, who last year killed a young gay man. And yet Agosin said that compared with other Latin American countries, the situation for Chilean Jews is very good. At long last a breakthrough in the case of Boris Weisfeiler, the Penn State mathematics professor who disappeared while hiking in southern Chile in 1985: Judge Jorge Zepeda has ordered the arrests of eight police and army officials. According to the indictment, a police patrol arrested Weisfeiler and tried to disguise the fact by claiming he had drowned while crossing a river. Three police officers, along with four members of the Chilean army patrolling the area, have been charged with kidnapping and concealment and a fourth police officer has been named as an accomplice. The case has meant “many, many years of frustration,” according to Weisfeiler’s sister Olga, who has visited Chile almost every year since the investigation was reopened in 2000. That was the year the Clinton administration declassified hundreds of documents dealing with Chile, including several cables in which the mathematician’s disappearance is discussed http://boris.weisfeiler.com/docs/US_declassified_documents.html . In one document, an informant tells U.S. Embassy officials in Santiago that Weisfeiler had been held captive in Colonia Dignidad, a German cult whose facilities were frequently used by the Pinochet regime’s secret police. The indictments were announced just as a delegation from the United Nations Working Group on Forced Disappearances completed a visit to Chile to study how the government has handled such investigations. A full report will be presented to the U.N. human rights council early next year, but a preliminary statement on their findings was released on Tuesday, August 21. The statement cited “the slowness of judicial proceedings, the application of military justice to current cases of human rights violations, the absence of an autonomous crime of enforced disappearance and the lack of a national plan to search for disappeared persons.” Of those cases in which former Pinochet officials had been found guilty, “very few of the convicted perpetrators are effectively serving a sentence, due to the low penalties imposed or other benefits granted.” The U.N. experts were impressed by the work of Chile’s Servicio Medico Legal, but urged the government to strengthen its role in investigating these cases, noting that most initiatives were led by victims’ relatives. Andres Velasco, who was finance minister during Michelle Bachelet’s government (2006-2010), is sometimes mentioned as a possible presidential candidate. Now a visiting professor at Columbia University, he recently published an opinion piece on Project Syndicate comparing the presidential campaign of Venezuelan opposition candidate Henrique Capriles to the “no” campaign against General Augusto Pinochet’s one man presidential plebiscite in 1988. Some background: many Chileans who fled the country during the Pinochet regime received political asylum in Venezuela. Back then Venezuela was one of the few countries in the region with free elections and civilian-led governments, while Chile and most of its South American neighbors were ruled by military dictators. The center-left Concertacion coalition which governed Chile for two decades after Pinochet left the presidency had good relations with Hugo Chavez, and even Sebastian Piñera’s conservative administration manages to do the same. The campaign headquarters of opposition presidential candidate Henrique Capriles feels and looks a lot like the headquarters of the “No” campaign against Chile’s military dictator of a quarter-century ago, Augusto Pinochet. Back then, very few people outside Chile thought that a ruthless dictator could be removed through the ballot box. But the democratic opposition prevailed in the 1988 plebiscite, and Pinochet had to go. Today, many in the global chattering classes are similarly sceptical that Venezuela’s political opposition can unseat the demagogic populist Hugo Chavez in the country’s presidential election on October 7. After all, Mr Chavez, who has governed Venezuela since 1999 and is in his third presidential term, maintains an iron grip over much of the country’s media and keeps an open wallet to pay for popular support. Such cables caused Washington to summon the Chilean ambassador to the State Department a few days before the plebiscite and warn that his country faced serious international condemnation if the voting process were sabotaged. But not all regime officials were going along with Pinochet’s plans. On the night of the vote the regime was still sitting on the results when Chile’s air force commander decided to “pull out the detonators” and announce to reporters that the “no” vote had won. These two guys outside my house today, maybe drunks, maybe bums, maybe just hard luck, but certainly hungry enough to be scouring the trash. One had a Calvin Klein bag with a beer can and some copper wires (bring a pretty penny, I believe) inside. The other had just found an artichoke and was chowing it down. (Also happy about some cold mashed potatoes, but more happy with the artichoke, which he recognized as being pricey). As I walked past, they asked me for change and instead I flashed them a big smile, like, “hey, I recognize your humanity but not your hunger, and continued on my way. Then I remembered that I had just seen a TV spot for Hogar de Cristo, where the passersby do just that (instead of “really” supporting social change by donating monthly…) . But it made me turn back. 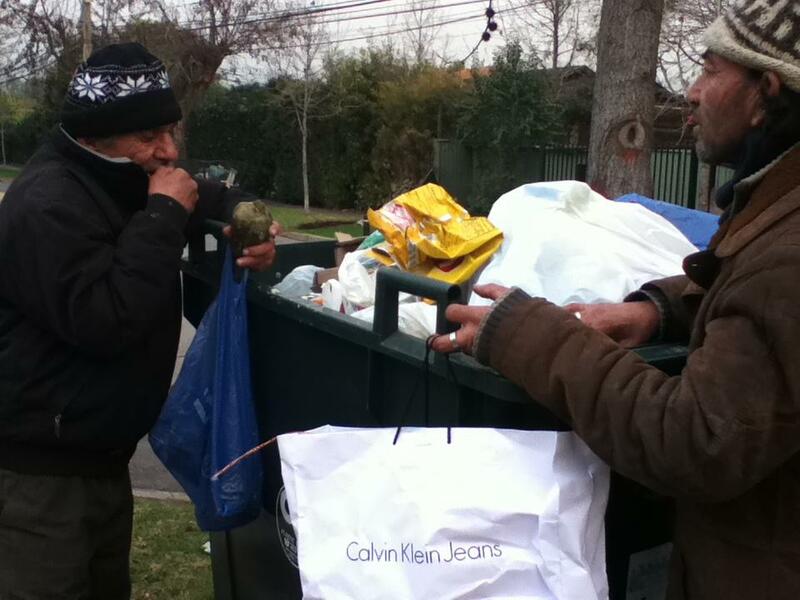 I asked them if I could take their photo, “to show my friends that there really is poverty in Chile”, as I put it. And they interrupted to specify, “hunger in Chile,” adding “don´t put it on Internet, or if you do, put it on YouTube”, And I pulled out a $1000 peso bill )about 2 bucks), to which the one guy said “great, we will split it” (good buddies, these guys), which seemed so ridiculous that I pulled out another.